For many newsreaders, a last minute spruce up before going live is to be expected. 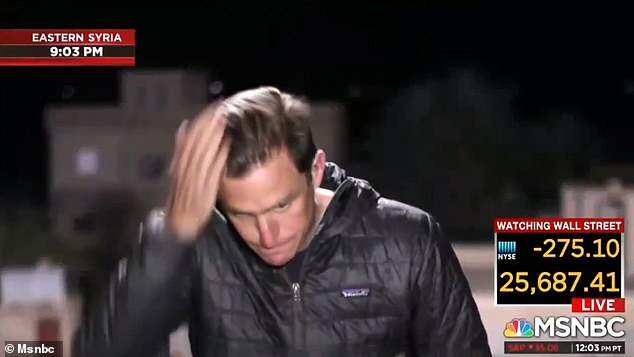 But MSNBC’s Matt Bradley took things to bizarre lengths when he was caught spitting into his hands and slicking back his hair unaware cameras were already rolling. 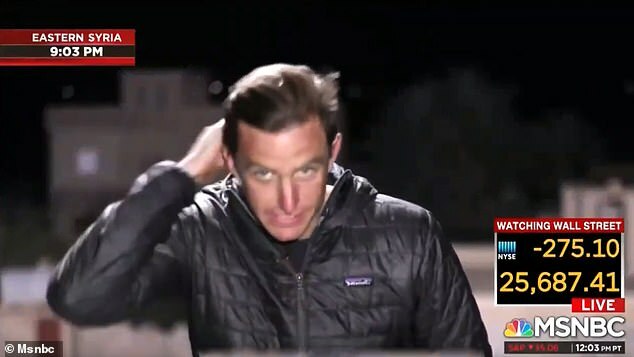 Broadcasting live from Syria, almost 6,000 miles from MSNBC’s New York HQ, the journalist who was preparing to do a piece to camera was unaware he was already live on air when he carried out his unorthodox beauty regime. 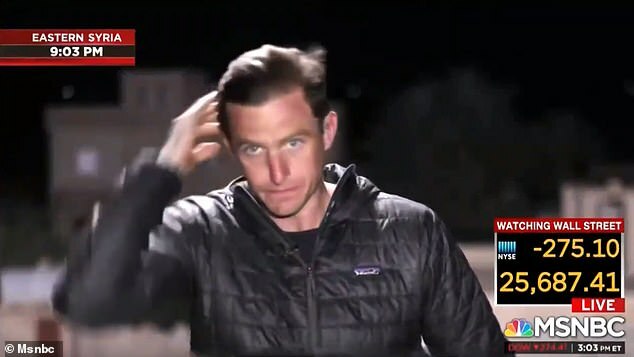 Bradley, who was reporting on the collapse of the caliphate in the region, spat into his hands twice and then ran his hands through his hair to perfect his dirty blond quiff, as anchors in the NY studio watched on sheepishly. The clip shared on Twitter shows MSNBC anchor Ali Velshi begin his reporting with Bradley not receiving any audio. ‘This just in, three U.S. military officials are in direct contradiction that the Islamic state territory in Syria has been 100% eliminated. ‘They say the fighting is still going. Matt Bradley is in eastern Syria where the last remnants where the so called caliphate were, what’s the situation for you,’ Velshi said. 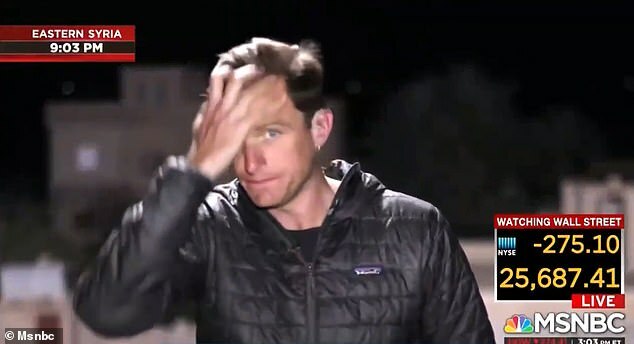 The cameras then cut to an unsuspecting Bradley who was caught in the middle of his last-minute grooming session. Despite the slightly embarrassing slip-up, Bradley has earned acclaim for his journalism – having filed from some of the most dangerous regions around the world. His report comes just days after US-backed forces were celebrating ‘victory’ after they captured a key ISIS encampment and reduced the terror group’s ‘caliphate’ to a few hundred square yards of bombed-out scrapyard in Syria. ‘I’m happy it’s over. Now I know my people are safe,’ said a fighter who identified himself as Walid Raqqawi who fought in the camp Monday night. He said he is returning to his hometown of Raqqa to rest. Comrades from his unit sang and danced in celebration at an outpost in Baghouz, all saying they were looking forward to going home.